Jerry Saltz won his second Ellie Award for New York at the National Magazine Awards in Williamsburg last night. 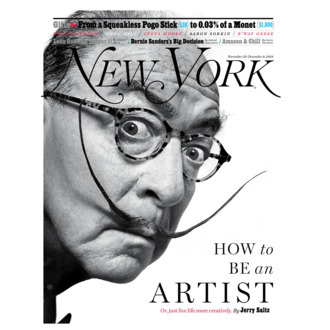 Saltz’s cover story from November 2018, “How to Be an Artist,” was picked in the Leisure Interests category. Saltz announced last week that he’s turning the piece, which is structured as a set of “rules” for how to live life more creatively, into a book. Saltz’s first Ellie for New York came in 2015 for Columns and Commentary. New York’s Olivia Nuzzi was also recognized with an ASME NEXT Award for Journalists Under 30. The New Yorker led all winners of the night with four awards, and The New York Times Magazine and Topic picked up two each. Saltz’s win marked the 41st Ellie overall for New York under departing editor-in-chief Adam Moss, who was honored at the ceremony with the Magazine Editors’ Hall of Fame Award for lifetime achievement. Before he took the stage, a video montage of covers from his 35-year career played for the audience.